We just read in the House of Gathering (Synagogue in Greek) "And God said you shall not see my face, for no man shall see my face and live". (Shmoth 33) and further on it says..."and thou shall see my back, but my face shall not be seen". Powerful words with an eternal message, for those who can see it. The Hebrew word used, Panai, means Face, but the same spelling also means Forward. The Hebrew word Ahorai, my back, is the same spelling as Aharei, After. The message is clear. You can see backwards but you cannot see forwards. A great philosopher once said, "The great tragedy of mankind is that life can only be lived forward but can only be understood backwards". The tragedy of this philosopher is that he failed to understand the nature of life, thus his mistake. What we are being taught here is that the nature of life is living with incomplete information, incomplete knowledge, a certain degree of uncertainty. Look at the stock market, a guessing game, educated guessing. Truthfully most of medicine is the same, thus the expression, "practicing medicine". No one knows what tomorrow shall bring, and that is how it was intended to be. No man shall see my face and live. You start a business, you make an investment, you get married but the truth is every one of these ventures involves risk. For no man shall see my face, no man can be absolutely certain about the future. Micky Mantle said, "Had I known I was going to live this long I would have taken better care of my body". My father used to say, "If I only knew how long I was going to live I could plan my finances better". The future does not belong to us. For thus it was decreed; no man shall see my face and live. It is not possible. Only when I pass, only after the fact can we truly understand what has happened. And thus we live our lives, with constant uncertainty. We must make decisions with incomplete knowledge for here we are being warned, if you wait for perfect knowledge you will never act. Study military history, how many blunders were made, generals were forced to make decisions with incomplete information. The same is true of all aspects of life, including self-defense, including Krav Maga. Many systems of self-defense "know" all in advance. Their defense is perfectly orchestrated to defend against the the expected attack. Of course this is built on an incorrect premise and in defiance of the Biblical words, "No man shall see my face and live". Indeed these methods will not allow you to live. There is simply no way to know what will happen. Thus we train differently. We prepare for all possible situations. Imagine a key. Each door in the hotel has a unique key. Each key is designed to match only one door. Thus you need 300 different keys to unlock 300 different rooms. You will need many keys and you will need to keep them in order. Now imagine the wonderful cleaning staff, how I admire and appreciate them. Imagine they must keep so many keys on them. This is too much to expect. The solution? A master key. This is the essence of IKI Krav Maga. We design a master key, a simple form of instinctive self defense that can be applied easily to a variety of situations, to open hundreds of doors, because you never know which door you will need to open, and you will have to open it in a hurry. When someone is chasing you with the intent of hurting you, you must open that door. You have no time to look through hundreds of keys. The same is true of Krav Maga. We do not teach hundreds of techniques because in a real situation you will be too nervous and tense to access any of these. Thus we train differently. Jennifer in Durban South Africa, IKI Krav Maga seminar hosted by IKI Black Belt instructor Tony Hardy. Our approach is to teach concepts and to train your body using its natural instincts. Our techniques are not based on memorization. You will never have a long list of steps to put to memory. We teach you how to "feel" the technique and allow your body to flow with the opponents energy using natural gross motor movements. There is no precision involved as precision will fail you in a moment of truth. We may be tired, distracted, fatigued, we need a self-defense method and mental training that will prepare us for these unknown situations, as no man knows the future, and none can know how an attack will take place. For no man shall see my face and live. So if you want to live, train correctly. That is our goal here at IKI Krav Maga. Do you truly want to learn Krav Maga? Do you want to see the fastest progress possible? 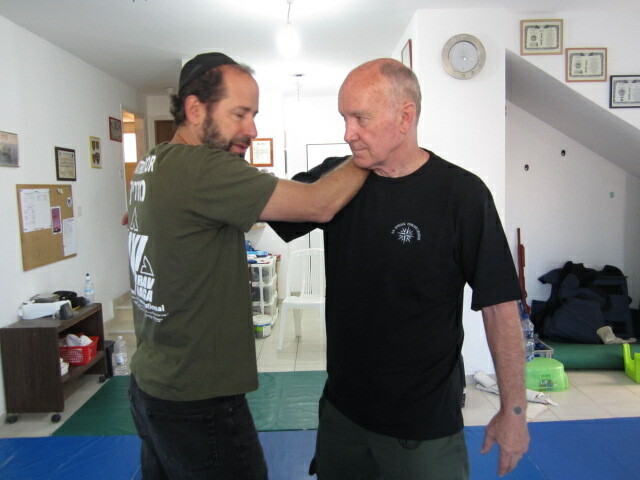 Then come to Israel and join us for Krav Maga Tour and Train Israel Experience. For beginners or for advanced practitioners and instructors. We will guide you step by step for the fastest progress. Legendary martial arts champion Frank Dux said he has never seen students progress so quickly in such a short amount of time. Learn all aspects of Krav Maga plus counter terrorism. Experience Israeli culture first hand. Meet war veterans and active soldiers. or contact the IKI office directly. We are a Nation of Warriors, and we all serve; Men, women, even dogs! Join us in Israel and experience this unique nation. Moshe Katz working with Alan Mann, IKI South Africa. 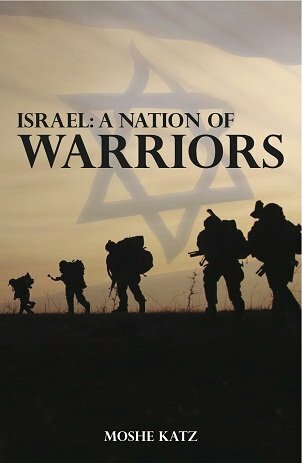 Understand the Israeli way of thinking, our warrior tradition and culture.